Metric and advanced features are only available to registered users. You can create an account or log in. This is your first quote as an anonymous user. In order to continue to get quotes beyond your third, you will need to create an account. We will never sell or give out your contact information. When you create an account, the process of creating a quote will be simplified and you can look back through your quotes history. If you already have an account, you can log in. Where will this building be built? How wide does the building need to be? How long does the building need to be? What is the height of the building at the eaves? The height entered is for the low side of the building. 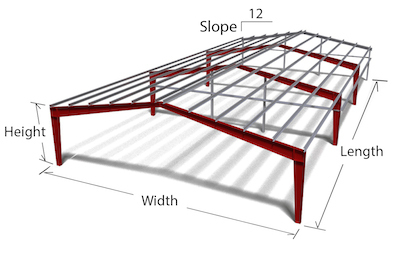 The high side of the building will be calculated when the height, width, and slope is entered. 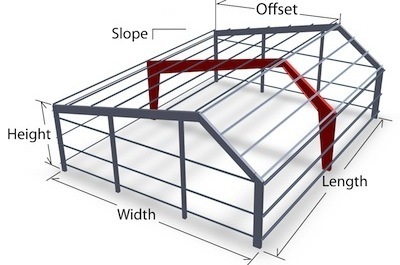 What is the offset of the peak of the roof? Plans I do not need engineered stamped plans only assembly plans. Provide 2 sets of engineered stamped plans for the state of %statecode%. Provide 2 sets of stamped plans and 2 sets of calculations for %statecode%. NOTE: 2 sets of plans and assembly manual come with each building regardless what is chosen above. NOTE: The customer (you) must confirm with the building department, which has jurisdiction over the location where the building will be constructed, that the loads and building code stated above meet all the legal requirements for your building design. You can make changes above and adjust them to what you know is true. Click on a wall in a bay you want to add framed openings. , looking from the outside. Click Done above when done. Changes to the bays will reset the bracing and remove all openings. Changes to the bracing will remove all openings. Drawing is for reference only and is not to scale. Hover over any dimension to make it larger. Click a wall button or a bay to edit details. Welcome to our Rapidset pre engineered metal building design and price tool! If you go through all the steps, at the end you will get a detailed building quote and you will be able to print out plans for the design. 1. On this first page you will need to enter your information or click anonymous. By entering your information we will be able to reference this design if you call. If you create your own account you will be able to access this design yourself and edit it if needed. 2. Name the project; the name can be anything you want to call the project so you will remember which design it is. 3. Enter he zip code of where the building is to be built. From the zip code we will figure the delivery cost and figure the default building loads and code. 4. Choose the building type, clearspan, with interior posts, single slope or unsymmetrical roof. The drawing will give an example of what type of building you are designing. Keep in mind that if you plan to use the single slope next to another building and it is lower then the adjoining building you will need to manually add 1.25 times the snow load for drift. 5. Enter the width. You can reference what the width is from the sample drawing. You can enter, for example, 40' 3" or 40ft 3 in or 40.25. The system will note an error at the top in red text if the entry is not within the limits or it did not know what do with your entry. You can even enter down to the 1/32 but if fine measurements are needed it is best to enter 40.2526 which is 40' 3 1/32"
8. Roof pitch or slope is entered within .25 to 4 meaning .25/12 or 4/12. At the present time we do not allow steeper slopes then 4/12 priced online. 9. Then press the green "Next" button to continue. 1. On this second page, at the top it should reference your city, state etc. If not, press the previous button on the top and reenter your zip code so that it is right. 2. I can not express how important it is that you confirm what the design loads and codes are for the your building site! A little snow load, a different code or exposure "B" to "C" will each be a different cost total. Our default loads and codes are close for your location but the local municipalities often get together and pass something to change these values all the time, therefore we can not be current will all locations. So click the edit button and enter what you know is the code. If you don't know you can still use the system * but just confirm these values before you purchase a building. Resellers, please be careful here and do your homework. 3. Where it says "plans" if you click "Edit Values" you can chose to not get stamped plans or add the design calculations to come with the plans all stamped by the engineer for your state. As it states 2 sets of "for construction" plans and the assembly manual come with each building. ONLY BUILD FROM THE "FOR CONSTRUCTION" SET OF PLANS. The first page will be stamped in red "for construction" and if you call that something is not working, our first questions is to ask what set of plans are you building from. 4. You will need to click * Agree and Accept to continue. 5. Then click the green "Next"
1. Given the load values of this design and overall measurements you entered, the system has chosen a bay layout for main frames and endwall columns. If you need to adjust the spacing click the blue button next to the wall you want to edit. Enter the number of bays you want and click the blue "Done" button. It will bring you back to the layout page with your new spacing. If the spacing to too far apart without an error the price quote will state "Error". 2. If you want to place a framed opening click on the box or bay you want to add an opening to. It will take you to a page to chose what allowable openings can go in to that space. If the opening you want will not fit in the bay you can go back and edit the bay amount for a possible wider space. Advanced users can edit exact bay spacing. If it allows a wider bay then again click on the bay where you want the opening and the options show change. 2 opening are allowed per bay but obviously they need to have the available space to frame correctly. For walk doors, do not add a framed opening if you want to order our walk doors. A wall girt is set to default 7' 6" so that a walk door will "clip in" and attach to that girt and if the wind load needs a low girt the door jamb will receive the girt into the jamb. 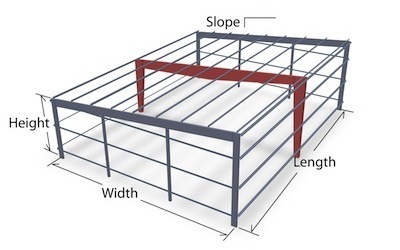 but if you want to order doors from another source or use wood doors use the 3' x 7' framed opening. If the building is ordered we can make the rough opening called for exact, just let us know. The Advanced Building Design section is reserved for builders, erectors and resellers. Some of the options are exact bay layout, girt height placement, exact opening locations, overhangs, lean to's, interior column placement, basically fine tuning the building design. This sections is still partially in development but as time goes by we will be adding more features to this sections. Our builders, erectors and resellers is defined as having bought many building from Rapidset Buildings and they understand what is involved in assembly and design of pre-engineered building. And most importantly we have a relationship over time. The tabs across the top are different type of accessories available. 1. Doors; if you want a door change the quantity to the amount of doors you want. The system will do the math. NOTE; For doors you do not need a framed opening, the door will clip in to a girt set at the default height of 7' 6" and the door jamb is designed to attached to adjacent framing to become a structural member of the building. 2. Gutters and Downspouts; Just click the type you would like and click the color you would like. The downspouts are figured at each frame line. 3. Insulation; If you would like an insulation package that fits this design check the box next to the thickness you want. You can only choose one wall option and one roof option. The insulation will come on a separate delivery truck. 4. Miscellaneous; Just check the quantity of the parts you would like. 8. Colors; Change the drop down bar for each part of the building. If this design is ordered we will confirm the colors so they can be changed. The only cost difference is changing from Galvalume to a color. Otherwise there is no cost difference between colors. Feel free to view or download any of the drawings for this design. We purposely left our name/logo off of the 3D drawings so, if needed, you can show your customer to sell the project. Please keep in mind if you contact us please reference the "project ID" number and your you contact information you used to make your account so we can reference this design. If you would like to purchase a full and complete set of plans for this design the cost is $19.95 (in the US) the set comes on 11 x 17 paper with assembly manual. If you like to purchase a stamped engineered set of plans for your state they cost 5% of the total building price. If the building is purchased within the expiration date then the 5% is discounted from the purchase price. If it is after the expiration date then the adjusted price applies. Please confirm the building design's loads and code by showing these values to your building department. If you find what looks like a better price please look it over carefully. 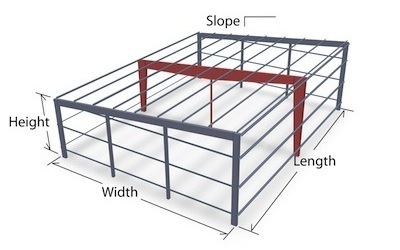 Most building suppliers leave off cable or rod bracing which is standard for a Rapidset Building. And look to see if they supply jamb covers for the framed openings which is standard for a Rapidset Building. Also does it have steel base trim, eave closures, sidewall panel closures if you do not get gutters? 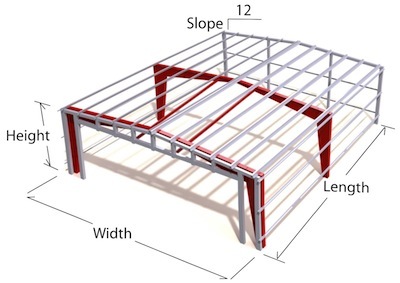 A full trim package is included with your Rapidset Building Order. And thanks for using our Rapidset design and price tool! If you have any feed back on how to make it better it would be great to hear your comments. As we are bring up the default loads and codes for your zip code, please edit them to what you know is true for your building site. You will need to "ACCEPT AS CONFIRMED" the design loads to continue. As you go through our design / pricing system please feel free to give us feedback on how we can improve it. In our FAQ section we will try to update users on new features we are working on. Once you finish and get your quote and print out plans if another supplier has a better price or design please give us a chance to meet or beat their offer. Our system is now creating your design, it will take a few moments. If you are a BUILDER, ERECTOR or RESELLER we would very much like to get to know you. To better understand your needs and do what is needed to earn your business. The typical building takes between 60 to 90 seconds for the engineering software to render. Once completed the "continue" button will appear at the bottom of this box. If your design has heavy wind or snow loads, is large or complex it might take just a bit longer to finish the design. Another option would be to send in your sketch or architectural drawings for us to quote. 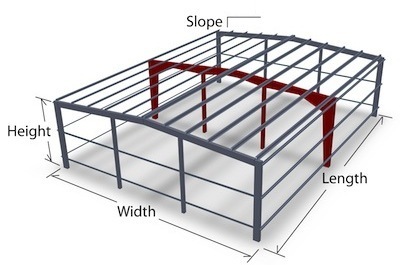 If it is something we can design using pre-engineered steel we would be pleased to send you a quote. As always please feel free to call us if you have any questions 800-793-8555 or if you are outside the US 719-268-1325. Our system in now creating your design, it will take a few moments. If you are a BUILDER, ERECTOR or RESELLER we would very much like to get to know you. To better understand your needs and do that is needed to earn your business. The typical building takes between 60 and 90 seconds for the engineering software to render. Once completed the "continue" button will appear at the bottom of this box. Another option would be to send in your sketch or architectural drawings for us to quote. 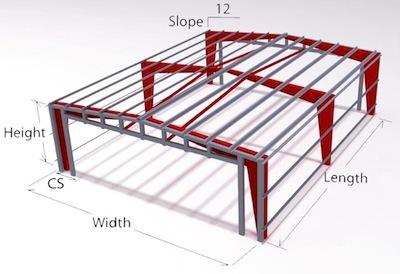 If it is something we can design using per-engineered steel we would be pleased to send you a quote. You must choose locations for the bracing. For questions about quote ID , please provide contact information so we can get back with you. For ordering this building design please print out the quote and confirm the loads and code will be correct for your building location. Then provide contact information so we can follow through for you. Ordering can all happen over the phone with a fax or scanner. What email address would you like to email this quote to? Changes have been made. Do you want to save the changes?